‘That’s cool.’ or ‘Hey man, cool.’ or ‘Whoa, over there, now that is wicked cool!’ People recognize cool, and for different reasons. Cool can be applied to a wall paper pattern or even to a flying frog being hurled by a rocket (look up Wallops NASA Frog). Everyone is different, and so is their cool perception. Take for instance smart phones. Smart phone companies spend a ton of money making sure their gadget looks cool. You can’t sit through a commercial break without seeing some company telling you about how cool you’ll feel or how your life will be forever changed by owning it’s phone. And people love it, they get excited over it, spending good money and a lot of their day with their phone. They even come up with special jargon to make it appear even cooler. But does someone telling you something’s cool make it wicked cool or does wicked cool sell itself? Sure, there’s a lot of insurance, investment and even pharmaceutical companies that borrow motorcycles to add cool for their own benefit but how many actual motorcycle commercials on T.V. are there? Not too many, because motorcycles are cool, period. Wicked cool! Most everyone knows that. They sell themselves. They were made to be free and go fast (did I mention LOUD? ), and here in America we love those two things. Put those two things together and it’s a no brainer why so many people have embraced motorcycles and the sub-culture they’ve made. Then add in all the custom bikes and modifying you can do to them and you come up with two different categories. 1. I got a bike and 2. Wish I had a bike. Not to say that motorcycles are for everyone, there’s a reason there are so many motorcycle insurance commercials but that doesn’t make them any less cool. It almost adds to the attraction - GO FAST AND BE FREE. And to make matters worse bikers have come up with their own dictionary that’s ten times better than any smartphone jargon. Let’s review: Farkle, Airheads, Bobber, Buckhorns, Burnout, Carving, Chopper, Friscoed, Enduro, Hog, Jugs, Iron Head, Knucklehead, Boneyard, Organ Donor, T Bags, Cager, White Walls, Colors, One-Kicker… and this list goes on and on solidifying motorcycles place in cool history. And for the record, one or even two ‘Farkles’ are ok, but never ever, ever, over do the farkle. Seriously. So needless to say there are a lot of motorcycles in Ocean City, Maryland right now. OC Bikefest 2013 is happening. If you’ve got a bike or just think they’re cool then head on down and check them out. There’s plenty of bikes to look at and admire and if you get tired of that there’s even more to do. Foghat, War, America and Three Dog Night will all be playing along with many other bands. The world famous Ives Brothers will be putting on their death defying tricks and there’s tons of vendors, stunt shows and demos going on. The event centers around the Inlet parking lot but there is something going on at pretty much every street in Ocean City, Maryland. 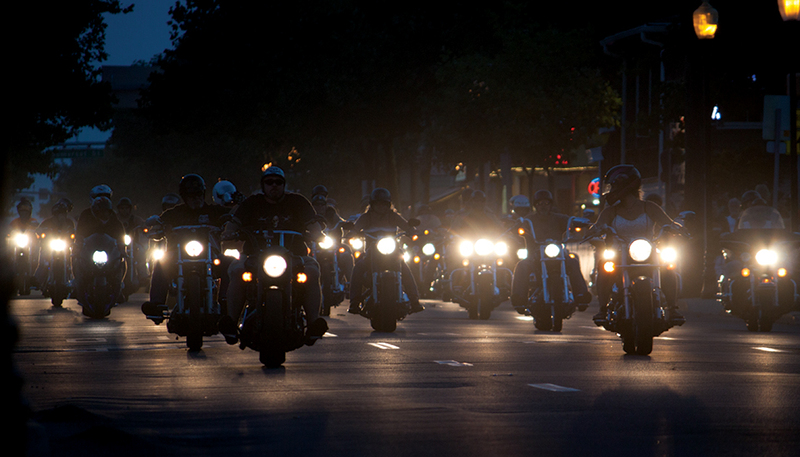 So to all the bikers and biker fans out there: Welcome to OCMD, Have Fun, and Ride Safe!